Doesn't your skin deserve the broadest, high-quality sun protection? 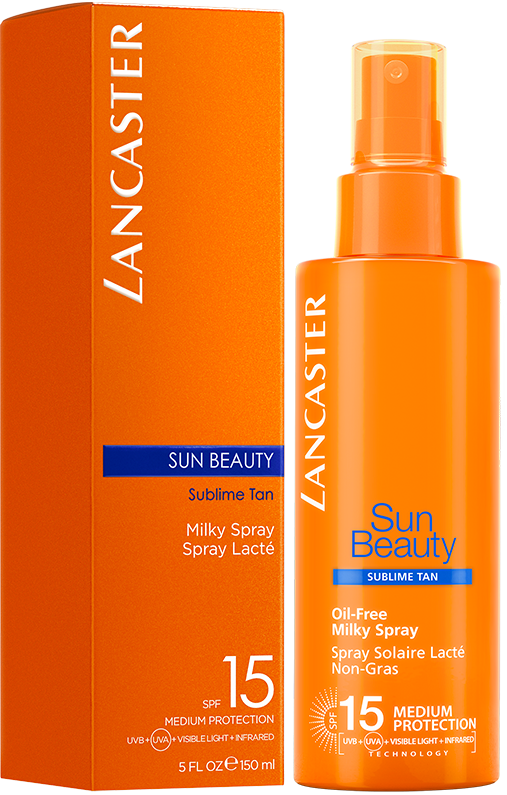 Lancaster's Sun Beauty Milky Spray SPF15 for body brings you broad spectrum protection as it helps you develop a lasting, golden tan. The unique formula combines our exclusive Full Light Technology, which targets 100% of the sun's rays, and our reinforced Tan Activator Complex. Enjoy that golden tan! Specially developed for medium to dark skin, for a luminous, and lasting tan. It is perfect for skin that tans easily and rarely burns. Sun Beauty Milky Spray SPF15 provides broad spectrum sun protection for your body, while it moisturizes your skin and helps you develop a sublime tan. Easy to spray, it penetrates quickly. Shake well before use. Apply Sun Beauty Milky Spray SPF15 generously all over your body before sun exposure. Spread the product evenly with your hands after spraying.